Dentsu Aegis Network on Monday announced the acquisition of Leapfrog Online. 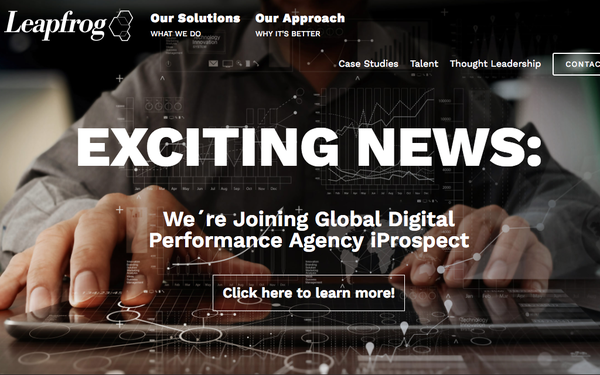 The U.S.-based performance marketing company will integrate into iProspect, the holding company's global digital performance agency. Financial terms of the deal were not disclosed. Leapfrog built technology that personalizes content such as dynamic landing pages. iProspect U.S. President Jeremy Cornfeldt told Search Marketing Daily that the acquisition makes it possible for iProspect to control the entire consumer experience from start to finish to support its more than 300 global clients. Whether to build or buy the technology is an age-old question. The process of making that decision requires extensive research into management, reviews and processes. "We look at the company's performance from a financial and HR perspective, but also go in and look at the code in the technology to make sure the architecture is flexible and can scale," he said. Leapfrog, an Evanston, Illinois-based agency, adds more than 150 professionals to support brands through technology such as the LFX Conversion Platform, bringing iProspect U.S.'s employee base to about 850. The acquisition also brings in marquee clients. Anthem is the only client that iProspect shares with Leapfrog. Other companies acquired along with the acquisition include Cox Communications and Chamberlain University. Other clients on the company's Web site include Allstate, Trugreen, and Universal Technological institute. Despite the long client list, Cornfeldt said the objective of the acquisition was not adding clients, but rather adding the talent and the technology. Leapfrog's technology sharpens iProspect's ability to deliver real-time personal consumer experiences through the entire purchase path, and strengthens its focus on analytics and omni-channel conversion optimization. Platforms like Leapfrog become smarter as they learn, Cornfeldt said. It's about taking data and making it actionable, he said, not just about collecting data for the sake of collecting data. Lately, the company has experienced a hiring spree, looking to fill positions in search engine marketing, analytics, data architect, and other data-related operations. As for the cofounders of Leapfrog, both CEO Dave Husain and President Scott Epskamp will remain with iProspect and lead the integration of the company's marketing technologies into iProspect.